Whisk together, vigorously, all ingredients except pork loin. Marinate pork loin for 4 hours or all day turning every hour or two. Remove pork from marinade and brown on a hot BBQ grill. Reduce BBQ heat to low and place pork on heavy duty aluminum foil. Drizzle with a little marinade and wrap up tight. Place on top rack of BBQ or an area without direct heat. Keep BBQ temperature about 325 degrees. Slow cook the pork until inside temperature is 160 degrees (2 to 4 hours). You can also cook this in the oven at 325 degrees for 2 to 4 hours. To brown the meat without using a grill, use a cast iron skillet and heat it on high on the range. Sear each side of the pork loin and then follow the directions above to wrap in aluminum foil. While pork is cooking pour marinade into pot and bring to a boil. Summer marinade for 10 to 20 minutes, stirring occasionally. 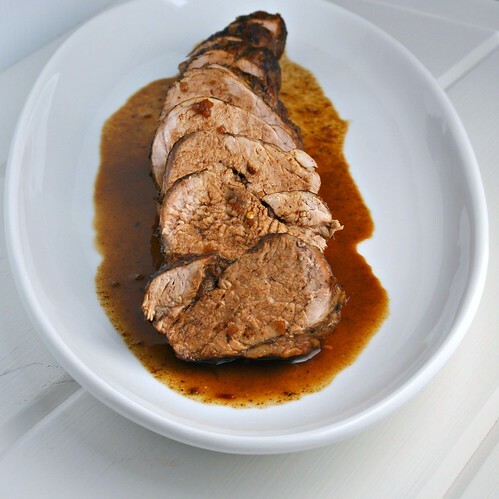 Slice pork loin into thick slices and drizzle with cooked marinade.